Missing teeth affect your smile, bite, and overall health. Dental implants are one of the best options because they replace both the missing root and crown of the tooth. Adams and Cheek Dentistry offers dental implants in Raleigh, NC. When teeth are lost, the remaining teeth will shift towards the gaps and can cause problems with the appearance of your face and your bite. When the root of a tooth is removed due to injury, periodontal disease, or decay, the bone tissue begins to shrink to fill the new gap. This will give your face an older, sunken look. When teeth are lost, the remaining teeth migrate into the new spaces. This changes your bite and it becomes difficult to eat. Getting Dental Implants in Raleigh, NC may prevent these effects. Dental implants are composed of a titanium screw placed in the bone, an abutment placed on top of the screw, and a dental prosthesis, such as a crown, that will look like your natural teeth. Dental implants can be used as anchors for bridges or removable dentures to replace several teeth. Replace one or more teeth without affecting teeth on the border of the gap. Teeth next to implants are not touched like they are with a bridge so quality is not sacrificed, a major benefit to overall dental health. Provide support for dentures to make them fit more securely. 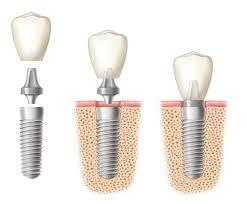 Dental implants with the attached crowns will look and feel like your natural teeth. No one will know they are implants unless you tell them! Bone level is preserved which maintains jaw integrity, preventing a sunken look to your face. High success rate with low pain- the supporting bone of your mouth has minimal nerve innervation, which makes for a relatively easy healing process. The American Academy of Periodontology provides more information about dental implants on their webpage. When you get your dental implants in Raleigh, NC at Adams and Cheek, you will be comfortably numb. We offer nitrous oxide sedation for patients who are nervous about getting dental implants or other restorative work. Dental implants require similar homecare to your natural teeth. Brushing and flossing are imperative combined with regular dental appointments to keep your dental implants in good shape. Schedule your appointment today at Adams and Cheek Dentistry in Raleigh, NC to see if dental implants are a good option for you! Click here or call our office located in Raleigh, NC at (919)866-1360.